Do you easily forget phone numbers or birthdays? Do you often lose your car keys? Are there times when you just can’t remember your bank card PIN? Do you lose focus at work by mid-afternoon? If you answered yes to any of those questions, then you need to sharpen your mental reflexes, fire those synapses, and give your brain a good, hard, and fun workout! 10-Minute Brain Teasers provides practical and necessary advice on how to keep your brain in tip-top shape. From logic tests to word squares to Kakuro puzzles, this book has the essential brain teasers for keeping your gray matter healthy. If you are looking to be able to focus during those long meetings or you just want to keep your mind sharp, these puzzles will be sure to increase your brain efficiency while providing a ten-minute workout for your cognitive lobes. 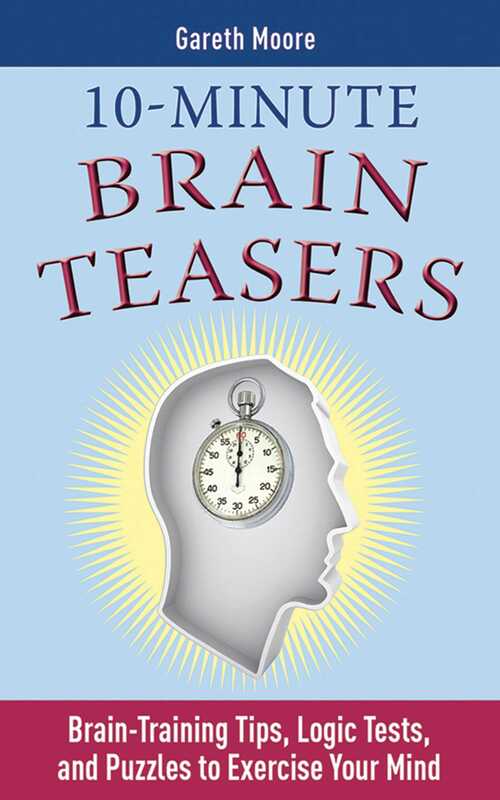 Like any workout, the brain teasers in this book start off slow and become increasingly challenging as you progress from simple memory tests to verbal-reasoning exercises. In the end, you’ll have a stronger, fitter mindand you’ll have had fun in the process. Gareth Moore earned his PhD at Cambridge University in machine intelligence and has used this experience in computer software research. He is the author of a wide range of puzzle books for both adults and children.